The Marathwada region in Maharashtra is in the midst of another drought. While most of the area is dry, some villages practising watershed development are surprisingly green. In the absence of political interventions some villages are going into self-help mode. Villagers allege vested interests in ‘man-made’ drought. Lack of policy changes and political will have also been blamed for current situation. Meena Menon travelled extensively through the drought-hit districts of Marathwada and writes about despair and hope in the region. Every few years, the recurring drought in Marathwada region of Maharashtra is attributed to poor rains. Stop-gap arrangements for tanker water, fodder camps or jobs under the Employment Guarantee Scheme (EGS) cannot substitute for a much-needed review of the situation, which only seems to be deteriorating with each passing year, despite an occasional good monsoon. The fact that this drought-prone area is host to many sugarcane factories and sugarcane farmers adds to the woes of farmers. This year, though, sugarcane factories are also suffering due to the lack of water and the next crushing season could see a 50 percent drop in harvest, as many farmers haven’t been able to plant anything. Yet sugarcane farming has overtaken horticulture and cotton as a cash crop with assured returns. That it uses up massive amounts of water is often glossed over. With the government failing them in many ways, people in the water-starved region have been fighting nature on their own by working out temporary and permanent solutions. The Krishi Vigyan Kendra (KVK) in Jalna district, under the guidance of Vijay Anna Borade of the Marathwada Sheti Sahayak Mandal (MSSM), has been doing pioneering work in setting up a working model for watershed management in the region. 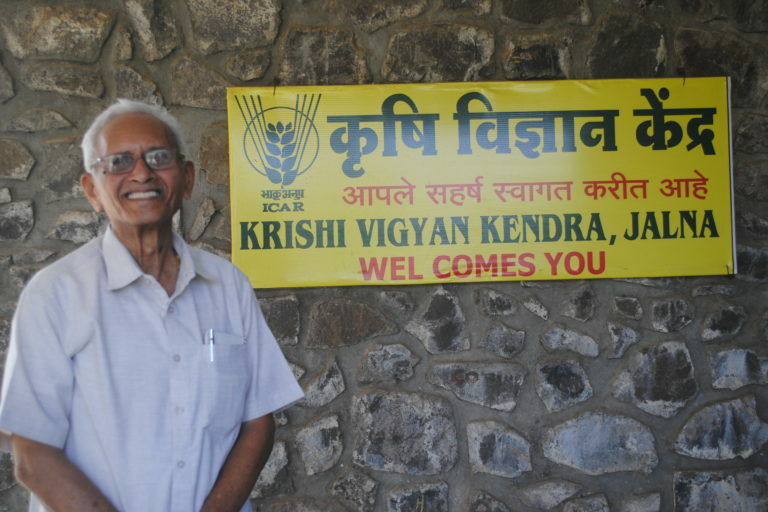 Vijay Anna Borade at the Krishi Vigyan Kendra at Jalna. Photo by Meena Menon. Borade, who witnessed the 1972 drought said: “It is not only failure of rains but also of policy, over the years. We feel that this drought is more severe than 1972 when the groundwater levels were better; back then, there was a crisis of foodgrains. Now, there is no water or fodder and the two are very difficult to mobilise. Every year, we have to fight for water from the Jayakwadi dam (on the Godavari in Paithan taluka, Aurangabad district). Water supply from the dam to sugarcane factories in the region and beer manufacturers in Aurangabad is also affecting agriculture.” Besides, many people are migrating, with little hope of returning, he added. According to Borade, the government’s neglect is a deliberate strategy to kill agriculture and make it easy for private business interests or corporates to take over the sector. The distribution pattern of rainfall has changed over the years, due to climate change and now rains are restricted to July and August. No crop can withstand the gap of 40 days between two good rains. “Drought cannot be avoided but certainly it can be better managed,” said Borade, who believes that the distribution seeds by the government to grow fodder is futile when there is no water for cultivation. “The government’s water conservation programme, Jalyukt Shivar Abhiyan, is unscientific and has caused irreparable damage as there is a uniform approach which may not work for each location. Mud is being excavated everywhere and the silt is being removed. The programme does not understand the geological situation. In addition, the work is done by machines and people are not involved at all, unlike the 1972 drought,” he added. Borade invokes the wisdom of the 19th century social reformer Jyotirao Govindrao Phule, who in his book Shetkaryacha Asud, written around 100 years ago, had mentioned integrated watershed management as the only solution to drought. Soil and water conservation are both important – simply widening nullahs (water channels) and removing silt is not going to help. The KVK has been adopting Phule’s vision to bring relief to the present situation. Kadwanchi village in Jalna district is a textbook example of ideal soil and water conservation work. Ridge-to-valley treatment with continuous contour trenches on the ridge and bunds around each farm, among other systematic measures, seemed to have worked miracles for the area. 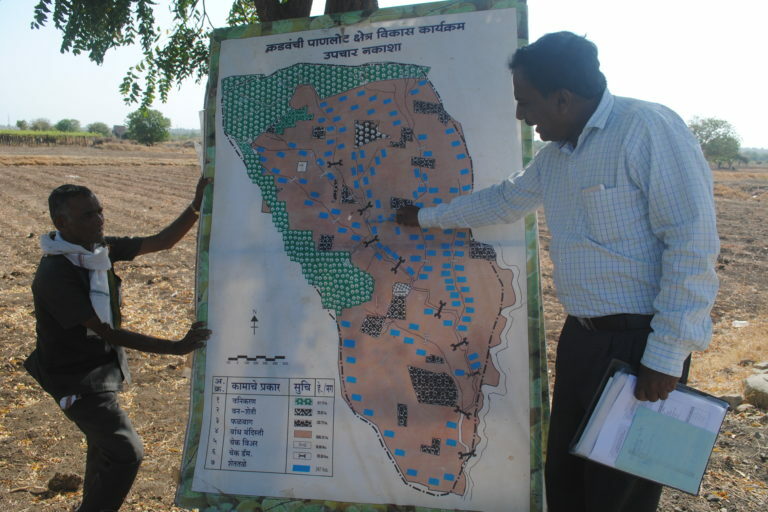 Pandit Wasre with the map of the watershed programme at Kadwanchi. Photo by Meena Menon. Pandit Wasre, agricultural engineer, KVK, accompanied Mongabay-India to Kadwanchi, which has low hills where the slopes were trenched and planted with trees. Apart from this, farms were also enclosed with bunds so that the water collected there and helped recharge nearby wells and shallow aquifers. According to Wasre, now 42 percent of the land is under perennial irrigation and check dams have managed to trap the subsoil flow. The Kadwanchi project aimed at increasing the water holding capacity of the soil – much like having water in a bank. “You can’t see the water but the shallow aquifers fill up and farm ponds are built for protective irrigation. Now people grow vegetables, grapes, soyabean, cotton and pulses,” Wasre added. On the main road, off Kadwanchi, women sell grapes in small stalls for Rs. 50 a kg. Inside the village, farm ponds are brimming with water and acres of lush grape cultivation enjoy the benefits of drip irrigation. The village pond brimming at Kadwanchi even during the drought. Photo by Meena Menon. While earlier the village subsisted on dryland farming and hardly earned any profits, now the annual turnover from grapes and other farming in the village is Rs. 550 million (Rs. 55 crores), Borade shared. The villagers did all this work themselves and generated Rs. 60 million (Rs. 6 crores) in EGS payments alone during the beginning of the National Bank for Agricultural and Rural Development (NABARD)-funded programme from 1996-97 to 2001-02. Bapurao Ambilwadi sells chemicals at his shop, assisted by his son Ravindra, who is a pursuing a Bachelor’s degree in Agriculture. Ambilwadi has planted five acres of grapes and earns Rs. 300,000 (Rs. 3 lakh) per acre. “I used to do mazduri (wage labour) earlier and helped the KVK in the survey when they started. I only had four acres but now with the money I earned, I bought more land and this shop too,” he said. The village has a water budget for each crop and also grows its own fodder. The farm ponds are used when average rainfall is less than 600-750 mm. The KVK has installed 25 rain gauges in Jalna taluka for accurate measurement. Kadwanchi is an oasis in the otherwise parched region. The area under grape cultivation increased 20 times after watershed management. There has been a significant increase in employment and income generation too with higher cropping intensity and diversion from agriculture to horticulture. The KVK works in 40 villages in the region and while all of these villages may not be as prosperous as Kadwanchi, there have been improvements in the harvest. While the model is replicable in areas with black soil, it has not gained wider acceptance due to various reasons, one of them being the lack of collective mobilisation for the programme. A grape farm in Kadwanchi. Photo by Meena Menon. The greenery in Jalna district is limited to a few villages like Kadwanchi and possibly the sugarcane factories. The Ankushrao Tope Cooperative Sugar Factory looks prosperous with hordes of sugarcane farmers bringing their cane for crushing and truckloads of more cane awaiting their turn. Green lawns and bright flowers welcome you to the memorial built to Ankushrao Tope, who carved out an empire of sugarcane factories, educational institutions and dairy business. But the severe water shortage hasn’t spared this business either. Shrirangbapu Paithani, a founder member of the factory, has not planted sugarcane in the last season due to the scarcity of water. Till date, the factory has crushed over 1.1 million (11 lakh) tonnes of cane in its two factories. But, of late, its daily crushing capacity of 4,500 tonnes has been hit by the lack of water and it is the water from the sugarcane that is recycled, since sugarcane comprises mainly of water, according to managing director Bajirao Pawase. Earlier the canal from the Godavari brought in water but with that thinning out, water is now supplied from tankers. The two factories need 340,000 (3.4 lakh) litres daily, while another 200,000 (2 lakh) litres is required for those who come there with the cane as well as for the residential staff, numbering 4,500 in all. The next season will be lean as most people did not plant sugarcane, he added. The factory has 12,000 members and over 15,000 farmers bring in cane here, for a price of Rs. 2,300 a tonne. 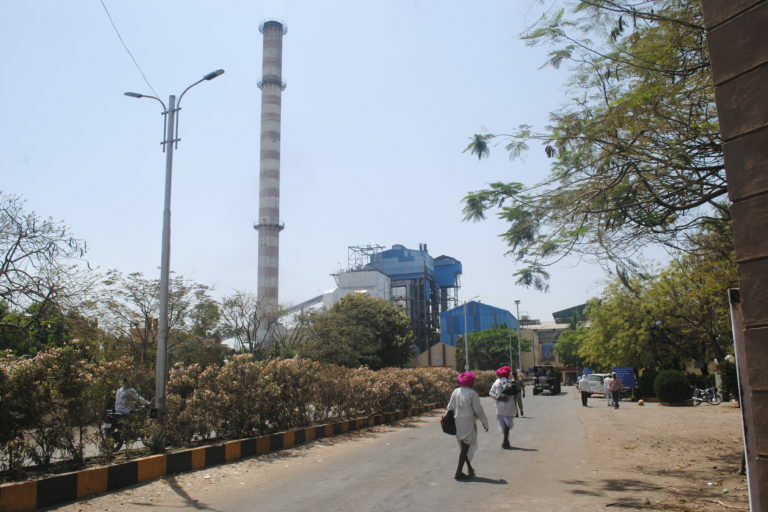 There are five working sugar factories in Jalna district while the other eight districts in the region have 57 working factories with Osmanabad boasting of 12, Beed eight, Aurangabad seven, Latur eight, Parbhani seven, Nanded six and Hingoli four. Sugarcane mainly grows in the canal-fed region but also elsewhere, which requires farmers to dig deep bore wells. The diversion of water for sugarcane and beer factories has reduced the availability for drinking but proponents of cane maintain that it’s the best cash crop and it gets the most income for farmers and in droughts, the stalks can be used as fodder which is what is happening now. Water budgeting seems to be unheard of in this region and the prosperity of sugarcane farming hides the penury of the rest. The Ankushrao Tope Cooperative sugar factory. Photo by Meena Menon. From the lush lawns of the sugar factory, the bare brown hills in Beed offer a dramatic contrast. Yet Beed district seems to be better off with cattle camps set up mid-March with provisions for water and fodder. Already the camps are full and buzz with activity. Nilavati Chavan has brought her cattle to the camp in Imampur in Beed but shrugs when you ask about water. “Don’t ask me that question. There is no water anywhere,” she says. Bibishan Chavan, a former sarpanch, has been managing the camp since March 16, with 450 heads of cattle. He believes in serving animals and brings water from Shahgadh, over 40 kilometres away. He has already spent Rs. 800,000 on the camp and hopes the government will reimburse him soon. This year, the state government made things difficult for cattle camps by insisting that the guardian minister of the area approve it. The earlier deposit amount was Rs. 500,000 (Rs.5 lakh) which has now been reduced to Rs. 200,000 (Rs. 2 lakh), to be paid to the district collector’s office. After a member of the Youth Congress, the youth wing of the Indian National Congress party, filed a case, the Aurangabad bench of the Bombay High Court on March 15 said there was no need for permission from the guardian minister. In nearby Imampur, women crowd around a water post filling pots with all the murky water they can before the supply, which starts at 6 a.m., stops at 10 a.m. Nevale Duraji, sarpanch of Imampur said he invested Rs. 150,000 (Rs. 1.5 lakh) for a pipeline for the water from a nearby source as there was no help from the government and no water tanker supply either. “I managed to do this almost overnight – there is a borewell from where we pump water and pipe it to the village,” he said. 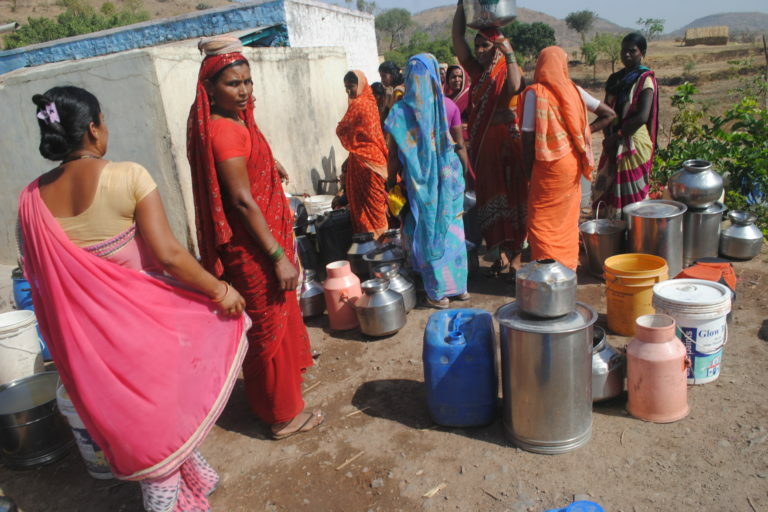 Women wait for water in Imampur village in Beed district. Photo by Meena Menon. At Anandwadi village, Revannath Devgude runs a cattle camp. There has been no power supply for two months, so he uses a generator to fill water from a well, six kilometres away. He has already spent a considerable amount of money buying 12 tonnes of fodder a day. “The government takes time to repay us, but we need to save our cattle. I also got some dried and chopped fodder from Gujarat,” he said. The village has just a few wells and hardly any crops thanks to the poor rains. There was no rabi sowing, just like in most of the region. In Beed district, fodder for cattle and water continues to be an issue and in Shirur, the Padmashri winner Sayyad Shabbir Budhan who looks after over a 100 cows, the reason for his award, is a worried man. His father Budhan used to look after these animals and he inherited that legacy. The cows are now catered to with a daily supply of 22,000 litres by tankers. His wife Ashrafbi said things were getting worse and the cows go for grazing to a hill nearby which has a forest with little greenery thanks to poor rains. Shabbirbhai doesn’t milk the cows and only looks after them. When Mongabay-India visited, fodder supplies were low but the administration quickly sent supplies a few days later. 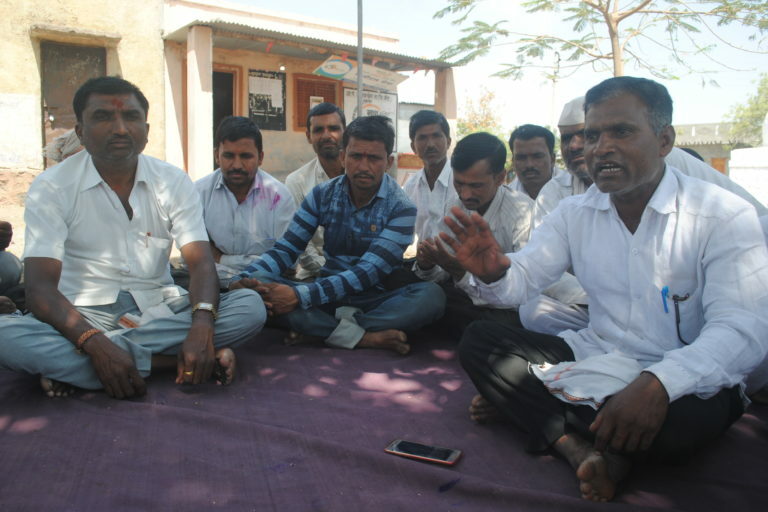 Shirur taluka has no dams or provision for water supply and the drought-like situation continues all through the year, said Gokul Pawar, a journalist with the daily newspaper Punyanagri. It was the worst affected taluka in the state and many migrated every year to cut sugarcane, due to the dry conditions. The government has been erratic in setting up fodder camps and supplying water too. Jatnandur village in Shirur, which won a prize for its water conservation scheme, the Jalyukt Shivar programme, is located between two small rivers – both now dry. Tankers supply water once in eight days to the village. There is a dam 36 kilometres away that is now the source for the tankers, after the dam nearby dried up, said former sarpanch Kishore Jedhe, adding that the two cattle camps close by have provided some relief. According to Jedhe, most people migrate every year for sugarcane cutting in Beed but this time only 50 percent of them have returned – due to the water situation. 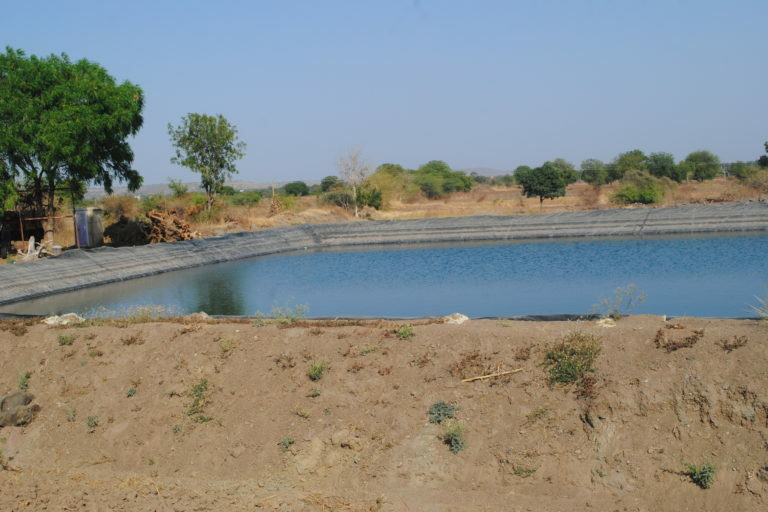 The Jalyukt Shivar programme barely helped – with the 100 village wells all dry. “A few Kolhapur-type (KT) weirs or check dams could have stopped the water and given us little for irrigation but the government has not done that or even installed a pipeline for water from the nearby dam,” said Jedhe. Given the situation in hand, the people are rooting for a change as they feel that the government has done little for them. 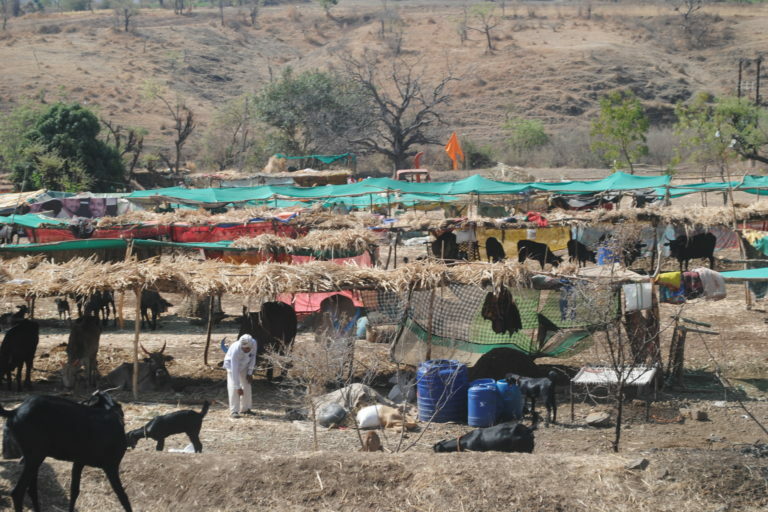 A cattle camp in Beed district. Photo by Meena Menon. Near Anandwadi, Mandavkhel village, atop a hill, is gearing up for the annual Water Cup contest, instituted by NGO Paani Foundation, set up by actor Aamir Khan and his director-producer wife Kiran Rao. The contest encourages villagers to apply training provided by the NGO in watershed management and water conversation. The Satyamev Jayate Water Cup is essentially a competition between different villages to see who can do the maximum work for watershed management and water conservation in the period of the competition. Mandavkhel villagers in Beed district explaining their competition under the Paani Foundation contest. Photo by Meena Menon. Thanks to the work done under the integrated watershed management programme and government schemes like Jal Swarajya, Mandavkhel has water and a piped system right up to people’s houses. Earlier they relied on tankers and walked five kilometres for water. Now there is water in taps outside every home, for an hour. Hand pumps too have water. While some villagers believe they have Prime Minister Narendra Modi to thank for this, others are of the opinion that the credit goes to older programmes. Many villagers feel that the earlier watershed programmes didn’t achieve anything as they lost most of their crop last year. They are not enthused by the Jalyukt Shivar programme either as work was done by contractors. “There is nothing happening through government programmes; we have lost faith in the government. So, we are going to improve our lives by our own work,” said Hanuman Kadam, the sarpanch, who has been leading the village in getting training from Paani Foundation. Villagers have now learned to use a mobile app, where they document their watershed management progress. They also prepare a balance sheet of their water budget and are keeping their hopes up about the next monsoon. People are impressed with the Prime Minister, but feel his subordinates and this government are disappointing, Bibishan Kadam said. While they are yet to get the money under the Kisan Samman, they fought for crop insurance and gheraoed a bank in nearby Neknoor and succeeded in getting a payment of Rs. 12 million (Rs. 1.2 crores) for their crop insurance after two years. 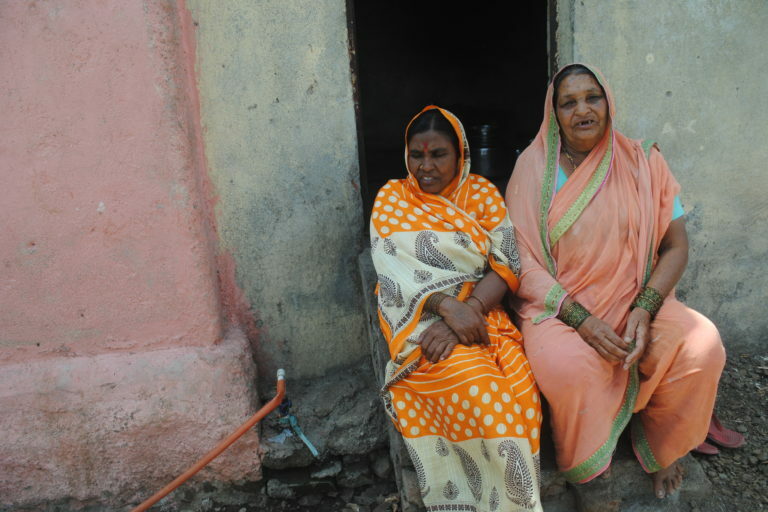 Houses have access to piped water in Mandavkhel, Beed district. Photo by Meena Menon. Though Todkar did not specify the “business”, it is obvious that it is in the form of tanker water supply, organisation of cattle camps and supply and sale of bottled water and reverse osmosis filtered water supply. There is no political will to harness the three main rivers in the region and provide people with water, he added. According to Todkar, the EGS must be linked to agriculture-related activities to make it work. The cropping pattern needs to change and the emphasis on sugarcane has to go, he said. Sugarcane continues to get subsidies and even failing factories are supported with subsidy while the farmers get none. The extensive roadwork too uses up a lot of water. According to Sanjay Shinde, a water management expert from Hind Sanstha, Neknoor, Beed, the government has spent millions of rupees on many rural schemes but in Beed district at least 40 percent of the villages don’t have potable water. There is a need to evaluate these schemes and find out what has gone wrong. Under the Jalyukt Shivar programme in 2015-16, rivers were desilted and deepened even in hilly areas without a proper understanding of the terrain or science. Soil conservation was not undertaken. Besides, it takes a minimum of three to five years for any watershed management programme to show any results. 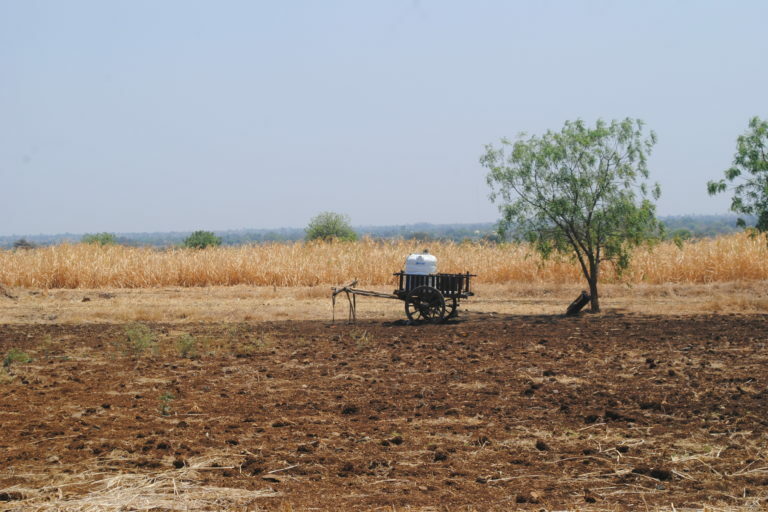 The drought cannot be tackled by repeating the same mistakes. A course correction is necessary by evaluating the programmes and learning from past mistakes, he insisted. Political will and policy changes need to go hand-in-hand to prevent the Marathwada region from ending up a desert. The common opinion is that right now, both are lacking. With recurrent droughts, dry fields like this has become a common sight in the Marathwada region. Photo by Meena Menon. 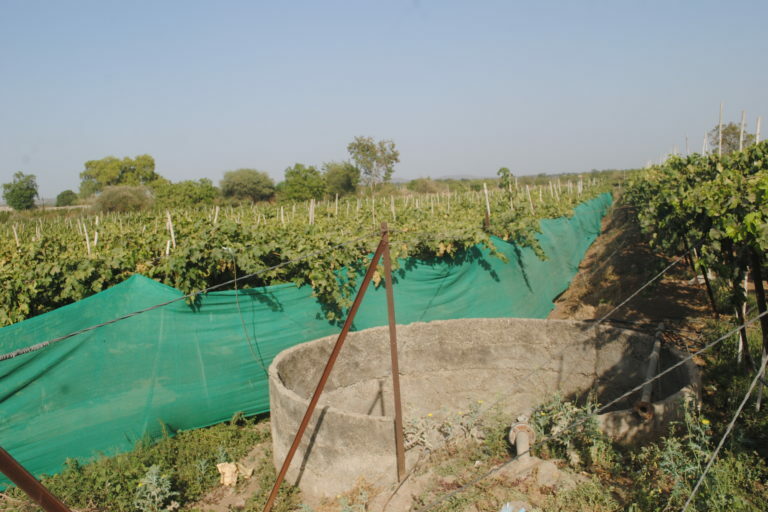 Banner image: Even as drought surrounds Marathwada, in Kadwanchi village farmers grow and sell grapes on the road, highlighting the importance of soil and water conservation through watershed development. Photo by Meena Menon.